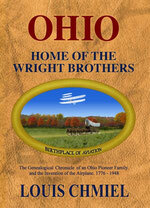 The book follows the ancestry of the Wright brothers from the Revolutionary War in 1776, through the settling of the Northwest Territory in 1790, Ohio statehood in 1803, the development of the National Trail through the 1830s, the Civil War in the 1860s, and on through the lives of Wilbur and Orville Wright as they invent the airplane. 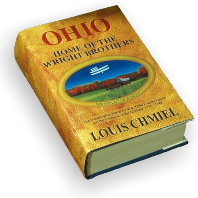 The lives of Milton and Susan Wright, the parents of the Wright brothers, are followed from the early 1800s on through the years when they raise their children in Dayton, Ohio in the aura of Ohio's heyday as the home of presidents. 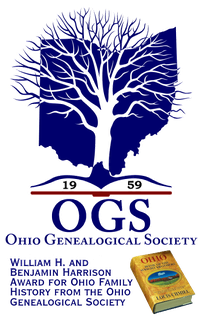 The 790 page volume includes 40 plus illustrated maps, over two dozen family letters, and numerous official documents which amplify and detail the story of the Wright ancestors in Ohio. The narrative is further documented through over 700 footnotes. Only $44.95 plus $5.00 media ship to the 48 contiguous United States of America with secure online checkout through PayPal. Louis Chmiel holds a Bachelor of Science degree in chemistry. His study of the philosophy of science and the biographies of notable scientists led him to the work of the Wright brothers. 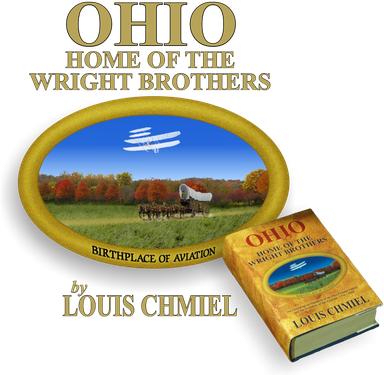 Hands on experience building replica Wright airplanes, coupled with a growing interest in the Wright ancestry led to the committed study which resulted in the book, Ohio: Home of the Wright Brothers - Birthplace of Aviation.